If research in an Arts Faculty means humane learning, then we all hope our teachers are as much involved in research as they possibly can be. We want them to know better and better what they are talking about, so that they will have, and will continue to have, something intelligent and important to profess to their students. But if research means output or publication, as it so often does today, how do the students profit? In his turn, Drummond quotes George Whalley, who suggests that the word “research” is altogether misleading or inappropriate when applied to humanistic inquiry: ““The functions of research are specialized and limited; … the word research is not a suitable term for referring to the central initiative and purpose of sustained inquiry in ‘the humanities. '” “Most professors in Arts Faculties,” Drummond proposes, “would be better off reading more and publishing less.” Of course, reading is research for most humanists–that is, it’s the research process. But not all reading is research–or it it? When we talk about “doing research,” I think we conventionally mean reading in service of a particular research project, that is, reading in pursuit of a foreseen research product, a published essay or book. Does that mean that reading for which we cannot already identify such an outcome is not research, then? Certainly it’s reading for which we can get no particular institutional support. For instance, if I want to get a research grant, it does me no good to justify my budget on the grounds that I am gathering materials on subjects about which I would simply like to know more than I do, or in which I have a developing interest but, as yet, no idea what, if any, payoff there will be in terms of publications. I also can’t get research support to develop new classes. I might be able to get a grant from our Center for Teaching and Learning–although peering at their page, the only grants I see them offering are for “faculty members who are seeking new and innovative ways to incorporate technology into their teaching practice” and “high impact initiatives that address student engagement activities/projects in the first year of their studies.” Too bad if I just want to follow my curiosity, acquire new expertise, and then gather students up to share it through reading and discussion. My own new class on the ‘Somerville Novelists’ may, in fact, incorporate technology (brace yourselves, students–I’m thinking wikis again! ), but it will have been developed from reading I did initially purely out of interest–and of books I bought with my own money. I don’t mind about the money–though it’s sometimes frustrating to realize how much the university relies on our willingness to do things “on our own” without which the institution would be a much poorer place, and by that I don’t mean poorer financially. (I bought the laptop I’m using with my own money too–the university doesn’t provide “home” or portable computers, or at least our faculty doesn’t, but imagine how academic work would grind to a halt if we could not work evenings and weekends, or not without coming in to campus. But that’s another issue…sort of.) I don’t really draw strict lines between what I do for work and what I do for myself, precisely because being a professor is not just having a job but having a certain identity–filling (or aspiring to fill) a certain kind of role in the world. But especially since reading Drummond’s essay I’ve been thinking about the way our particular understanding of “research,” one that yokes together the process and the product, undervalues other kinds of reading. I do mind about that, because I think it artificially narrows both that job and that identity. Is there really only one professionally worthwhile kind of reading? 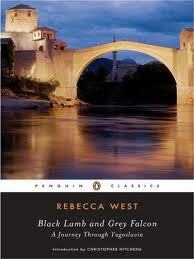 I’ve recently bought Rebecca West’s Black Lamb and Grey Falcon. I bought it out of interest: I’ve been exhilarated by learning about other early 20th-century women writers, and West is a major figure. I’m not sure where to place her: she’s not specifically in the Somerville crowd I’ve been looking into, and she’s not really a Modernist (I don’t think). I’m curious to figure out more about her. Reading The Return of the Soldier made me more curious. She is not–and Black Lamb and Grey Falcon is not–obviously continuous with any issues or genres I have an explicit “research” interest in. There are plenty of books in “my field” of Victorian literature that I haven’t read, and there are also plenty of books about Victorian literature that I haven’t read. I have some declared “research” projects that have not reached the official finishing point of publication in an academic journal (much less an academic monograph). Clearly, if I read (when I read) Black Lamb and Grey Falcon I am doing it only for myself: it’s not research. And yet reading it will almost certainly help me have “something intelligent and important to profess to [my] students,” and that I don’t know exactly what else will come of it isn’t necessarily a bad thing. It isn’t even necessarily a bad thing that nothing concrete (beyond some blog posts) may ever come of it. But by some measures–the only ones that mean much, professionally, these days–it would be more productive for me to read the umpteenth specialized analysis of Middlemarch. Now that would be research. You need a book grant, Rohan. I have one – £400 a year. When I told someone else about the grant the other day, he said ‘that’s not much’, which to me sounded ridiculously ungrateful. It’s my research lifeline. Particularly when all my research has been clustering around contemporary fiction and film for some years now. On the one hand, books are too recent for the library to hold them in stock, and on the other, you have to read a lot to make sense of emerging trends. Research reading is a princess-style inquiry – you have to kiss a lot of frogs before you find a prince! Of course if you just kissed a lot of frogs for the hell of it, that would be… worrying. There has to be some sort of intention behind it all, however vague and ongoing. I sympathize with the frustration of trying to balance the clear needs of general research reading against the specialist expectations of research funding. While I love technology, I think it’s idiotic to put such a premium on technology being the crux of new teaching funding. @litlove, I agree about the value of a “book grant.” Just last week I was told I was eligible for a “professional development allowance”–of up to $100 (about 63 GBP). That’s truly “not much”–but I am grateful, in the circumstances, even though my unionized colleagues get one automatically of about 3x that much (which still is not a lot, but at least it’s in their contract). That said, though the terms of this allowance do include books, we are supposed to justify them with reference to the research projects they support… I did order Ahdaf Soueif’s new book on Cairo and the revolution for it, since Soueif is an official declared research subject of mine. @Janice, you’re right about tying teaching development to technology. I like technology too, but it’s not the only way to make a class original or new, and it’s not the only thing that costs money either. I think this is why many humanists prefer the term scholarship. I have noticed that some teaching focused universities call their office of research services something that includes “research and scholarship” perhaps to recognize that fact and also the fact that some research/scholarship is primarily in service of teaching. I am also worried by the way the research that fits into the mandate of the federal granting agencies (like SSHRC) is privileged to the extent that it coming to define what counts. I don’t think the intention ever was that those agencies would cover all of the research and scholarship being done in universities. The fact the a certain goal-oriented style is suitable for a SSHRC grant does not mean that is the only thing that counts as research. This also affects those who do research whose primary purpose is to enhance professional practice or communi goals of some sort, despite the increased attention those kinds of outcomes are receiving from the councils. I suspect that some day you will publish something about Somerville novelists or West or both. That doesn’t make it your goal right now. All research starts in the way you describe. For some people that phase is but a dim memory due to a level of specialization that means they are following a trajectory already laid down. Being only on the edge of academia I found your post quite interesting. It seems that one of the difficulties of a professor especially in the humanities, is that so much of what you do contributes to your work but not always directly so that you don’t get “credit” as it were for all the work you do which is a shame really.